The J&K Peoples Conference (JKPC), which was being supported by the BJP, was upbeat over the demolition of the bunkers. 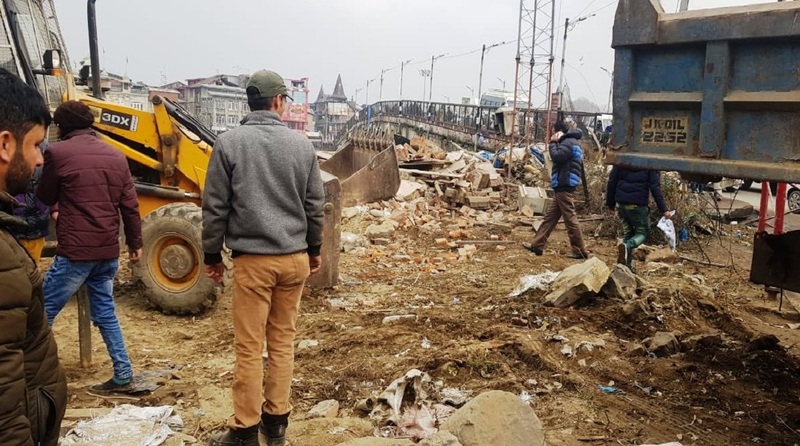 Three anti-terrorist bunkers of the CRPF in the sensitive area of Amirakadal Bridge in the heart of Srinagar city were on Tuesday demolished by the Srinagar Municipal Corporation (SMC). These bunkers were established in the area about 28 years ago following a series of terrorist attacks. The area is just near the famous Lal Chowk. The JKPC chief, Sajjad Lone, welcomed the step of SMC. These bunkers were considered vital for security as CRPF personnel deployed there had thwarted several terror strikes during the past 28 years. Reports said that the SMC acted after the local Dastageer Sahab (RA) Shrine Auqaf Committee claimed that the places occupied by CRPF were their property. These bunkers were established at the end of Amira Kadal Bridge in 1990s when terrorism was at its peak.